Desert Wisdom. Some people say that today telephones have become smart while people have become simpler. Since we got accustomed our smart devices to think instead of us and help us complete numerous tasks. Supposedly that is the reason why we are turning to our ancestors when we have a need of some wisdom. The modern professions have put philosophers into second line, so in luck of modern thinkers, we turn to the past. And it is also interesting that even though there might be one truth, different civilizations explain it on different ways. And the diversities of cultures and civilizations wake up or improve our creative thinking. Bryan is a historian that likes to find out more about the people that lived before many hundreds years. He likes to learn something more about their way of living and that’s why he has chosen this profession, but also he is fascinated by the ancient wisdom, as something that helps people even today and makes them smarter. The new target of this curious historian is Iraq. His current passion is the Persian culture, so he has traveled so far just to fulfill his passion and find out everything first-hand. Exploring the remains of this culture, Bryan finds out blocks made of stone. Where are written the wisdoms of the rulers of the famous Persian civilization. There is much that can be learned from those stones so let’s check them out and see how were those ancient people thinking, discovering the philosophy of their lives and ruling. 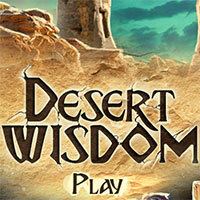 Desert Wisdom is a free online hidden object game on Hidden4Fun.